Whether you are trying a keep your New Year's resolution or just trying to maintain a healthy weight, you need to find a scale that you can trust. I have had scales in the past that were inconsistent, and while some days it made me happy to see a lower weight, other days is was just plain frustrating. Weight Watchers® by Conair™ Digital Scale Model WW58S not only provides gentle motivation and inspiration, but is also consistently accurate. I have tried standing in numerous different positions on the scale and the weight is always the same. It is a definite keeper. 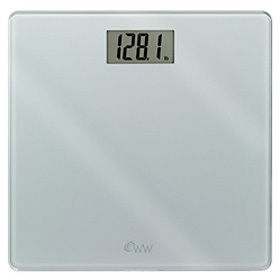 The Weight Watchers® by Conair™ Digital Scale Model WW58S comes with 15 reusable stickers that provide various messages to inspire you to stay strong and stick to your goal. It even comes with a blank stick that you can fill in with your own message to yourself. Change your stickers as often as you like and stick them anywhere on the glass surface. The scale itself has a glass top and is very slender. It has a 1.5" digital display that shows your weight to the tenth of the pound. 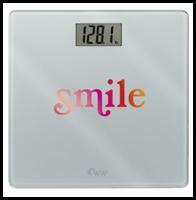 The scale has a 400lb capacity and runs on one long-life AAA lithium battery that is included. The scale also has a 10-year warranty. Would you like your very own inspirational scale? One lucky reader from Between the Lines will have the chance to try it out. Simply enter on the Rafflecopter below! I'd love to win this scale to keep me straight as to my actual weight. This looks like a nice one! Really NEED an accurate set of scales! !